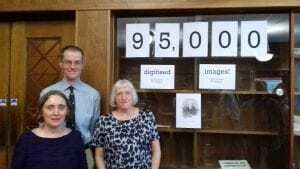 Project update – celebrating the digitisation of Bentham’s manuscripts! I’m sure most of you saw our fabulous news about the complete digitisation of Bentham’s manuscripts. Over 95,000 images of Bentham’s writings from UCL Special Collections and The British Library are now available in digital form – and we thought this was worthy of a bit of a celebration! 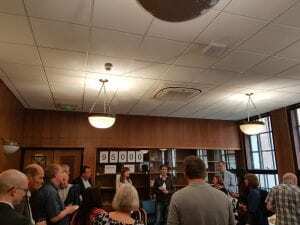 On 6 June 2018 about 30 of our friends and supporters joined us for a party in Bentham House, the newly refurbished home of the Bentham Project and the UCL Faculty of Laws. Our party in full swing! 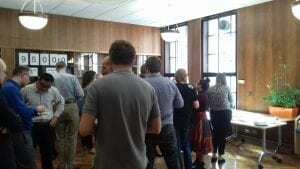 As the wine flowed, Bentham Project staff mingled with colleagues from The British Library, UCL Digital Media Services, UCL Centre for Digital Humanities, UCL Library and further afield. 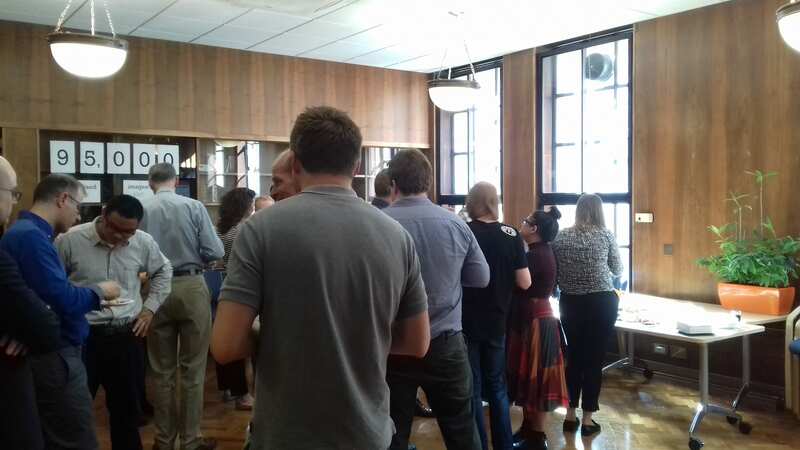 We were also delighted to welcome four volunteer transcribers to the party – this was possibly the first time that we have had several volunteers in the same room! Annette Brindle (Annieb2), Simon Croft (S.D.Croft), Diane Folan (Diane_Folan) and Gill Hague (ohsoldgirl) were all in attendance and took the opportunity to share some transcription tips and tricks with each other. Transcribe Bentham volunteers Annette Brindle, Simon Croft and Gill Hague. Transcribers Diane Folan and Simon Croft puzzle over some tricky Bentham marginalia. Of course, you can’t have a celebration without a few speeches. Professor Philip Schofield, director of the Bentham Project, gave an overview of the history of Transcribe Bentham: from its origins in 2010 to our present-day experiments with Handwritten Text Recognition technology. Professor Melissa Terras, formerly of UCL Centre for Digital Humanities, now at the University of Edinburgh, spoke about how important Transcribe Bentham has become in the wider digital humanities landscape. It was then up to me to convey our gratitude to everyone who supports and contributes to Transcribe Bentham – especially our loyal transcribers! It’s time for speeches from Professor Philip Schofield and Dr Louise Seaward. Happily we also received multiple messages of congratulations from volunteers and academics who were unable to attend the party. We include them below to give a flavour of Transcribe Bentham’s international standing. With thanks to everyone who sent their good wishes! Thanks to Transcribe Bentham’s staff, volunteers and supporters for sharing so many of your lessons learnt, for the benefit of many others interested in the potential for crowdsourcing and online participation in work on cultural heritage collections. Congratulations on achieving this milestone, and here’s to many more in the future. Transcribe Bentham is not just an inspiration for all digitization projects: It also demonstrates, that highly demanding tasks–like transcribing and tagging–can be done efficiently and collaboratively in the digital age. Congrats and Chapeau. To all involved in the Bentham Project, I’m so sorry I can’t be with you at the celebration. It’s wonderful to see all the volunteers taking part in transcribing Bentham. More than 20,000 pages of Bentham’s writing transcribed by volunteers — this must be productive of utility for those who are freely choosing to do the transcribing, for the wider audience whose reading of Bentham’s unknown work is thereby facilitated, and in the long run, I hope, for those who will be affected by changes in our thinking and policies that stem from a better understanding of Bentham. I would add that I enjoy the Bentham Project for three reasons: 1. puzzling out the letters on the page, 2. fitting the words together to make sense, (rather like a cryptic crossword), 3. the occasional gem of insight into life and thought from the early nineteenth century. The news about the completion of the digitisation of the main collections is wonderful, and many congratulations to all concerned (a huge number of people, of course!). Thanks for the invitation to the event on 6 June. Unfortunately I can’t be there, which is a pity. I’d like to say I’ll be with you in spirit, but I think Bentham would disapprove. I enjoyed the opportunity to participate in the project. 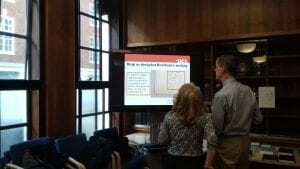 I had completed a Masters in Criminology and when I read about it, I was keen to help. It was fascinating to have access to the originals and to be able to make a contribution, however small to making Bentham’s work accessible to the public. Congratulations to all involved. It proves that together we can do great things. When I joined Transcribe Bentham in 2010, I could not have anticipated the significant impact it would have on Bentham Studies, Digital Humanities, and Citizen Science, and I feel honoured and grateful to have been part of the project at its outset. Congratulations to all—staff and volunteers—who have contributed to making Transcribe Bentham such a noteworthy scholarly resource and an important contribution to knowledge. I don’t know if one day we will be able to identify the source of this score but I think it illustrates the experience of transcribing Bentham’s material… you discover unexpected things which, at first sight, seems partially irrelevant, and, then, you begin to think that there is a beauty in it (until the mystery of the score is solved!). Before the complete digitalization of 100,000 Bentham pages, I used to look at Transcribe Bentham and I was happy to discover the new good quotes and progress made thanks to the volunteers (thanks Tim!). Now that this is done, more discovery will (hopefully) happen and this is great news for history of political thought and classical utilitarianism!